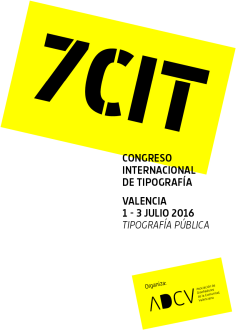 In 2014, the International Typography Congress of Valencia, organized by the Association of Designers of the Region of Valencia (ADCV) celebrates its ten years. It’s been a decade, in which for many, it has become a model inside the Spanish and Latin American typographic scene, and with no doubt, the most important typographic event amongst all the ones celebrated in Spain. Five successful editions have taken place along this ten years and prestigious figures have attended them, figures such as: Javier Mariscal, Rubén Fontana, Gabriel Martínez Meave, Claude Mediavilla, Marian Bantjes, Vincent Connare, Huda Smitshuijzen AbiFarès, Sebastian Morlinghem, Erik Spiekermann, Saki Mafundikwa, Mario Feliciano, Pierre di Sciullo, Óscar Mariné, Akira Kobayashi, Yves Zimmerman, Pilar Cano, Sergio Jiménez, Alex Trochut, Ken Barber, Ale Paul, Hermann Zapf, Mario Eskenazi, Pepe Gimeno, Román Gubern, Hilary Kenna, Petr van Blokland, Josep Maria Pujol, José Martínez de Sousa, Pablo Cosgaya, José Scaglione, Dylan Kendle, Christian Annyas, Pep Patau, Andreu Balius, Diego Areso, Josema Urós, Enric Jardí, Flan, Jordi Embodas or José Ramón Penela are just some of a quite large list. The Congress has also been used as a platform to promote the projects of new rising stars in typography design. It has been a place for exchange, both opinions and information between experts in the subject and a place to spread relevant researches in the field of typography. In that sense, it would be important to point out that when it all started in 2004, the typographic initiatives in Spain were quite few and scattered. There where very few specialized books on the topic, few thesis had been developed, there were not many courses and the professional typographic designers could be count on the fingers of one hand. The scene has changed a lot since then, and for good. That is why, to commemorate the Congress celebrates a decade of history, we have considered it was time to stop and look back to these ten years and see what has happened in the Spanish typography scene to be able to outline which direction it will take in the future.